Uganda gorilla tracking safari in Bwindi can be carried out in the four gorilla tracking places that have been partitioned in the park and among these include Buhoma gorilla tracking area were Habinyanja gorilla family is located and hence booking your gorilla trekking safaris and tours to Uganda will enable you to have a memorable experience of tracking the Habinyanja gorilla groups in the Buhoma gorilla tracking sector ranging from Kahororo to Rubona. Encountering this habituated group on Uganda gorilla safari tour is interesting because the group has 17 individuals’ members with 2 silverbacks inclusive and this offers great chances for a group of 8 trekkers easily view the gorillas in their natural form other than other habituated groups which have few members of the gorillas. The great enjoyment is derived when the gorilla opens its wide big eyes to look at the tourists direct in the eyes and through the physical encounter each other’s keeps on learning the other party very well. 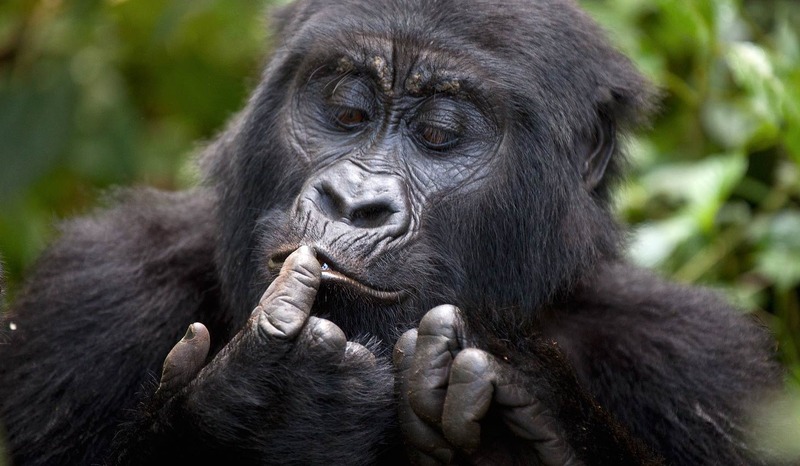 The leader of the group always encountered on gorilla safaris in Uganda is called Silverback Mizano and he was habituated in the year 1997 and it was first visited by tourists in year 1999. The wonderful name “Habinyanja” was derived from the Rukiga speaking people who were first seen living next to a swamp in the park boundaries .The word “Nyanja” in Rukiga means “a place with water”. During the time of habituation the Habinyanja group was first led by the common Silverback Mugurisi, the name which means “Old man”. After failing to live past these days due to old age, the two brothers known by the names of Mwirima and Rwansigazi shared leadership of the group but unfortunately the two never had something in common and hence they couldn’t continue sharing power. The only chance that Rwansigazi had over his counterpart was that the Rwansigazi was adventurous gorilla hence liked travelling from one area to another , whereas Mwirima only preferred to stay at one place. It was therefore unavoidable that in year 2002 the two silverbacks decided to part ways, without any conflict. The group that followed Rwansigazi maintained the name Habinyanja and the members who stayed with Mwirima came to be known as the Rushegura gorilla group. Later, Makara took over leadership from Rwansigazi, Makara who is now the current silverback leader of the Habinyanja gorilla group. Sometimes, both groups still come across each other but co-exist rather peacefully. The interesting bit of this gorilla group is the wonderful succession history that it holds and when narrated to you by the experienced guide while on your gorilla trekking safari in Uganda.